Cinema Obscura is a new monthly feature at From the Front Row, highlighting little-known films that I believe need a second look. The mission of Cinema Obscura is to bring attention to hidden gems readers may not otherwise have had a chance to discover. The Kazakh New Wave is perhaps one of the most unique and overlooked cinematic movements of the latter part of the 20th century. Emerging from the ashes of the failing Soviet Union at the end of the 1980s, Kazakhstan proved to be fertile ground for young filmmakers exploring the complexities of newfound independence. These filmmakers openly challenged the establishment of Soviet thought and filmmaking standards that consisted mostly of historical epics that celebrated the communist ideal. 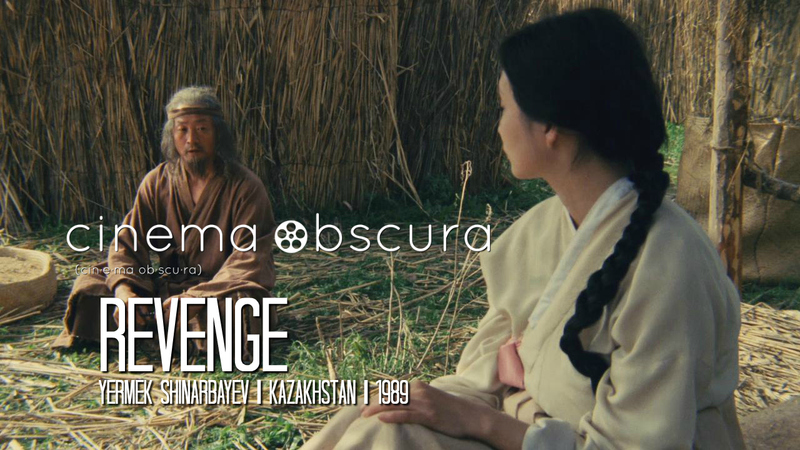 Yermek Shinarbayev's Revenge is perhaps the most well-regarded film to come from the Kazakh New Wave. 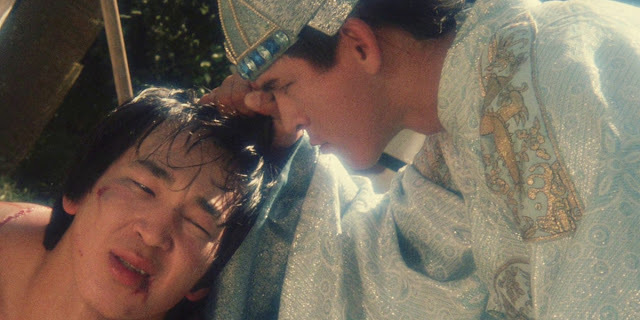 Released in 1989, Revenge has all the trappings of a historical epic opening in ancient Korea in a royal court, where the King, after witnessing his young son run from a fight with another boy, decrees that the captain of his royal guard must toughen his son up into the greatest warrior in the land. If he fails, he will be executed as punishment. The boy does indeed grow up to be a formidable warrior, and befriends a young poet who becomes his one source of comfort and entertainment. Yet the king is unjust, and the poet requests to be released from his service, lest the the king's toxic sense of masculinity, fueled by his late father's insistence that he be the strongest in the land, stifle his creativity ability to see the beauty in the world. Devastated, the young king sends the poet away, never to return to the palace. From there, the film shifts gears entirely, flashing forward to the early part of the 20th century. It is as if Shinarbayev is shrugging off the oppressive shackles of Soviet Russia and the cinematic form it forced upon Kazakh filmmakers, thumbing his nose at the stodgy historical epics of old and tossing traditional form out the window. These opening scenes are seemingly unconnected with what follows, but they're there for a reason. This is where Shinarbayev subtly sets up the film's theme of cyclical violence reverberating through time, as a father passes his own harmful ideas to his son, who in turn uses them to damage an entire nation. The film's main story revolves around a young girl who is murdered by her drunken teacher. Her father, unable to exact revenge on his murder, takes a mute concubine at the behest of his barren wife to bear them a new son whose sole purpose in life will be to grow up to carry on his ailing father's quest to kill the man who murdered his sister. Revenge relays his story through a series of chapters, each chronicling new people he meets on his journey for retribution. Each segment takes the story in a new direction, making a relatively linear plot into something that feels completely removed from any typical sense of time and place. Cinematographer Sergei Kosmanev shot many of the scenes with a backlit glow that gives the film a dreamlike quality; we almost forget that we have moved into the 20th century and away from medieval Korea. Revenge seems to stand apart from time, achieving a kind of spiritual remove from the constraints of human consciousness and linear thought. Shinarbayev has been criticized for this by some, and this dogged refusal to adhere to general rules of filmmaking is perhaps why the Kazakh New Wave never rose to prominence on the world stage. And yet the way in which Shinarbayev purposely chucked the Soviet rulebook out the window (a staid, non-revolutionary form that even the great Soviet cinema theorist Sergei Eisenstein was eventually forced into by Joseph Stalin) and started from scratch is invigorating, flying in the face of not only Soviet form but the very ideology of perpetual retribution that drove its government. 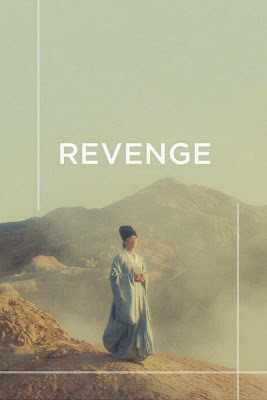 Revenge is a film of textures and impressions, of images and feelings, suggesting the very idea of vengeance as a sickness that permeates the fabric of time and infects generation after generation. There is little violence in the film, but its effects are keenly felt, reverberating through the ages like a some sort of genetic disease. The Kazakh New Wave was unfortunately short-lived, and Kazakhstan's tiny film industry currently only manages around 15 films a year. But Revenge is a gold-standard work that drew the attention of Martin Scorsese's World Cinema Project, debuting on DVD and Blu-Ray from the Criterion Collection last year. Long out-of-print and hard to find, the film has been given a new lease on life, and is ripe for rediscovery for cineastes all over the world. For Kazakhstan, it represents a rich artistic tradition far from the Borat caricature that it became known for in the last decade, one not afraid to ask probing questions for which there can be no answer. Shinarbayev's mesmerizing vision is as potent and as relevant as ever, across time and culture, as a painful warning of the generational effects of violence and resentment, an age-old human affliction that remains with us still today. Revenge is available on Blu-Ray and DVD from The Criterion Collection, and is currently streaming on FilmStruck.